Questioning the assumed ‘irrepresentability of finance’ and critically looking at works of Geissler / Sann, Andy Warhol and the Institute for Human Activities, Steyn Bergs asks if better practices and models for the redistribution of wealth via art and its institutions could not be developed. Reflexivity is what is needed, he asserts, especially because art is so implicated within the world of finance that it displays a highly similar relation to the value form. 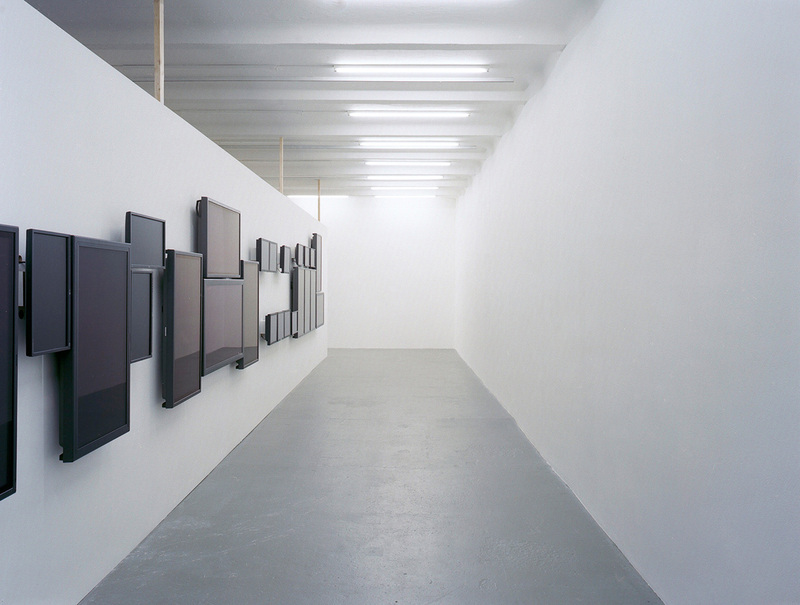 Geissler / Sann, Volatile Smile, mixed media, dimensions variable, installation view at Neue Gesellschaft für bildende Kunst, Berlin, 2011, courtesy Geissler / Sann. Since the 2008 economic crisis, we have witnessed the emergence of an entire discourse in art practice centred around representations of the financialization of economy. One basic assumption underpinning most of this artistic and textual production is that successful representations of finance today are wholly impossible: work in this discourse recognizes, for instance, that the sheer speed of financial transactions renders them beyond (or below) the treshold of human perception, making them literally extra-aesthetic, unavailable to the senses. Within this form of production an uncanny concreteness is often given to abstractions of financial capital (transactions made by non-human agents in the virtual sphere of electronic futures can have devastating effects on very-much-human agents). Much work within this discursive strand thereby seems to further the already widely held conviction that the complexities of finance are essentially irrepresentable. At its best, this ‘irrepresentability of finance’ discourse is highly politicizing. Its emphatic failing to make finance intelligible could be an effective means of pointing to its parasitical and exploitative relation to what one might be tempted to call the ‘real economy’ – that real economy being one that takes up Marx’s labour theory of value wherein a commodity’s exchange value is determined by the amount of labour power socially necessary for its production. But seeing as it is precisely the relation between labour or actual productivity and valorization that finance so obviously refutes, it can come as no surprise that there exists within Marx-inspired critical theory a tradition of writing about the financial sector only in the most hysterical of registers. It is striking, for instance, that even Fredric Jameson (that most down-to-earth and materialist of thinkers) took recourse to writing of ‘the former material world’ when confronting financialization in his 1997 text ‘Culture and Finance Capital.’1 Post-2008 books and essays dealing with finance in a similar tone are legion: one example is The Uprising, in which Franco ‘Bifo’ Berardi rather provocatively compares the increasing autonomization and abstraction of value in finance to that of language in poetry.2 Both Jameson and Berardi (and many others with them) wilfully describe financial capitalism as a free-floating cybernetic system that creates exchange value out of nothing more than the circulation of deterritorialized information. These descriptions run alongside occasional acknowledgements that financial capital, too, in the final analysis still depends on the exploitation of labour power, and that there can be no creatio ex nihilo of value without third world proletarianization and fourth world precarization. Nonetheless, if capital has often been considered vampire-like, then finance is treated today as something even more monstrous, as ‘the vampire’s vampire.’3 Authors like Jameson and Berardi do indeed mystify finance to some extent, but the point is that these mystifications have some potential to become politically mobilizing. While raging against mystifications of all sorts is often considered to be an old leftist hobby-horse (much to the annoyance of certain social scientists with a passion for declaring that this model of critique has run out of steam), their go-to texts such as Marx’s Capital and The Communist Manifesto in fact make good strategic use of mystificatory language by literally referring to all kinds of supernatural creatures and powers – vampires being only one example, alongside zombies, fetishes and spectres of all sorts – to point out contradictions in capital. Jameson and Berardi operate within this same tradition, as do the many artists (and art theorists) dealing with the limited representability of finance today. Their aim is first and foremost to problematize. (Which, one could argue is enough; it is after all not really necessary to understand exactly how complex mechanisms of derivative trading function to have an opinion on them.) Moreover, these problematizations of the ostensible irrepresentability of the abstractions of finance can sometimes be employed as highly accurate representations in the negative of these abstractions – showing how they operate in and leave an imprint on material reality. At its worst, however, this very same ‘irrepresentability of finance’ discourse turns finance into a supreme object of leftist melancholy. Irrepresentability, in these cases, does not stand for anything any longer, and mystification serves no purpose. In their book Cartographies of the Absolute, Jeff Kinkle and Alberto Toscano heed ‘a widespread cognitive and aesthetic impasse in what concerns giving form to capital, crisis and contradiction,’ and assert that this impasse is particularly apparent in the art world in which the irrepresentability of the financial sector takes centre stage.4 The photographic series volatile smile (2010) and the installation of the same title (2011) by artist duo Geissler / Sann are exemplars here. While many things could be said about the darkened trading screens that feature in both works, it is in any case clear that they threaten to dilute the ‘irrepresentability of finance’ discourse to its most basic assumption: finance defies representation. Not only are the trading screens reminiscent of Ad Reinhardt’s black paintings – not in the least because of the white cube setting in the installation – but they also effect a highly similar tautological reduction. If Reinhardt’s work was art-as-art, then the trading screens in Geissler / Sann’s work appear to signify irrepresentability-as-irrepresentability. These blackened screens do not put the limits of representation to work, but rather function as stand-ins or signs in a one-to-one correspondence with an already assumed irrepresentability. It should, however, be added here that Geissler / Sann have complemented both the photographic series and the installation with photographs of deserted homes in the Chicago area (in the Volatile Smile book as well as in exhibitions), thus establishing a somewhat more interesting relation between the trading room and its effects on the outside world. In this broader sense, their work, too, is an attempt at demonstrating the aforementioned concreteness of financial abstractions. Nonetheless, Geissler / Sann’s two works demonstrate that the current discourse on the irrepresentability of finance threatens to come to a deadlock. It has proven to be a productive and interesting line of enquiry for art, but there is no use in uncritically reiterating its idées réçues in ways that only mystify finance to an unnecessary degree. Kinkle and Toscano are right to argue that there is an impasse, that there is ‘more indulgence than reflexivity.’ Reflexivity is indeed what is needed, especially because art is so implicated within the world of finance that it displays a highly similar relation to the value form. 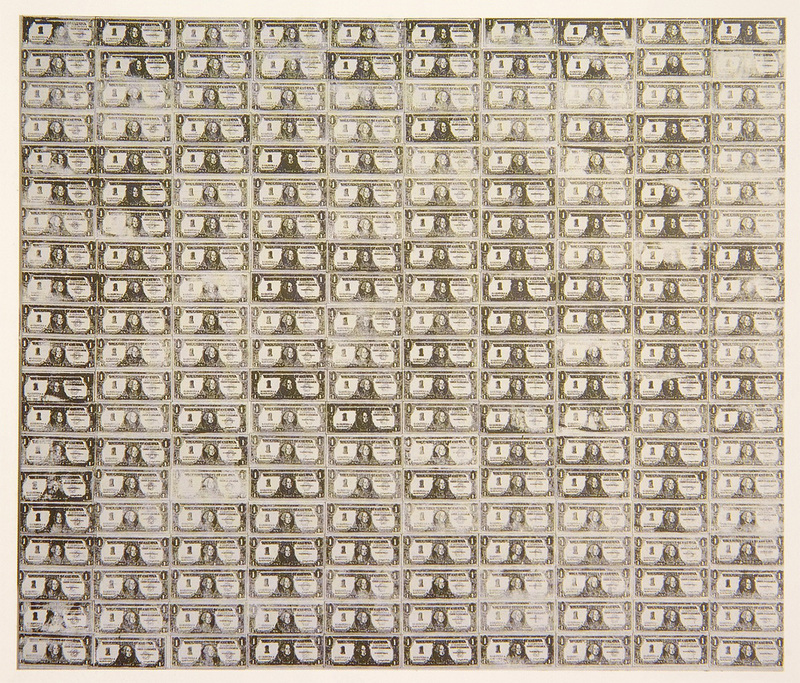 Andy Warhol, 200 One Dollar Bills, 1962, silkscreen ink and pencil on canvas, 203,8 x 234,3 cm. The work of such art workers, then, always inevitably raises the question as to how making an artwork is different from producing any other kind of commodity. This is the case especially with Warhol, who loved to indulge in the contradiction of fashioning himself as an ordinary labourer in capitalism at large, while also navigating the exceptionalism of the art market with great expertise. And indeed, in the case of 200 One Dollar Bills, it is alluring to imagine him producing the work, engaged in a form of labour that, oddly enough, is way better business still than the printing of actual paper money – depending on how many silkscreens he would have printed. While Duncan’s accelerationist politics clearly leave a lot to be desired, his analysis is extremely revealing in the current historical moment, when material production and the creation of value seem to have switched places. To refer again to the labour theory of value: it was conceived in a time when exchange value could only be generated by the circulation of commodities on the market, so after these commodities were produced. As Duncan’s position makes clear, this situation has quite literally been perverted: value creation now effectively precedes the kind of productive activity so beautifully described by Marx as the metabolic interaction between human beings and (the rest of) nature. The ECB decides to create value, and then European factories pop up like labour power-absorbing fungi on the shores of Southeast Asia. The Federal Reserve prints a trillion dollars, and then we carpet the Nevada desert with solar panels or start doing groundbreaking cancer research. By sheer numbers, of course, the Federal Reserve’s quantitative easing scheme makes Warhol’s creatio ex nihilo powers seem rather insignificant. Despite the enormous quantitative difference, however, it must be observed that there is a similar mechanism of value production and reproduction on the basis of authority at work in both. In his contribution to the Commonist Aesthetics essay series, Matteo Pasquinelli raised an important question: Who owns the monopoly of abstraction?19 At least to some extent, it would seem to me that artists such as Warhol, because of their close proximity to the 1 percent who buy their art as assets or luxury items, do indeed own such a monopoly, allowing them to generate exchange value seemingly out of the blue. Richard Florida addresses a crowd via Skype at the Institute for Human Activities’s opening seminar in June 2012. Still excerpted from www.vimeo.com. In passing, it is worth pointing out here that the idea of artistic labour (or ‘creative’ labour more generally) as directly productive of value – and therefore worthy of exploitation – is not exceptional at all any longer, but has become rather commonplace. More specifically, I am referring to the widespread enthusiasm concerning the so-called ‘creative economy’ here, an enthusiasm best exemplified by Richard Florida’s book The Rise of the Creative Class (2002) and its follow-ups. As Bernard Stiegler points out, the notion of the creative economy rests above all on the idea (which in itself can hardly be called innovative) that value and wealth are generated from ideas more than anything else.20 In this discourse, however, ‘creativity’ generally tends to be considered an incredibly open signifier. Martha Rosler, for instance, has pointed out that what Florida has labelled the ‘creative class’ makes up about thirty percent of the workforce in the US – which gives the Floridas of this world plenty of opportunities to cook their books.21 While it would be interesting to examine in more detail how the idea of the creative economy relates to art’s alchemical creation of value, I will now keep my focus on the art world, which is only one segment of what Florida, in all apparent earnestness, calls the ‘super creative core’ of the creative class. An entirely different strategy is employed by the now-infamous Robin Hood Minor Asset Management Cooperative. The Robin Hood Coop was initially conceived of by its current chairman Akseli Virtanen at the School of Arts in the Aalto University of Helsinki. Since June 2012, after being judged potentially dangerous for the university’s reputation, the cooperative has been functioning as a ‘counter-investment bank,' which claims to rethink the financialization of the economy for the benefit of the precariat. It does so mainly by relying on the ‘Parasite’ algorithm, developed by Sakari Virkki between 2003 and 2009. Put simply, this algorithm follows the swarming of the best players in the financial market and ‘free-rides’ along with them, automatically investing where they invest, and selling when they sell. The profits are subsequently reinvested in different commons-producing projects. This strategy of using finance’s abstraction for good has rather tremendous shortcomings, however. For instance, Virtanen himself agrees that it is perfectly possible for the coop to invest in a company like Monsanto to then support a project fighting them.23 In other words, the Robin Hood Coop’s ‘parasitic’ strategy vis-à-vis financial markets, is constantly at risk of becoming a symbiotic one. Nonetheless, it is the Robin Hood Coop’s self-positioning as (also) an art project that is telling here: the organization describes itself as ‘non-representative, non-visual, non-performative’ and ‘non-conceptual,’ with no ambitions of becoming part of an already clearly delineated art world, but artistic nonetheless. Although it does intend to latch onto ‘art’s power to create unforeseen and unthinkable – economic, political, social, emotional and organizational – processes.’24 And art’s potential to valorize out of nothing is certainly one of those processes hinted at here. 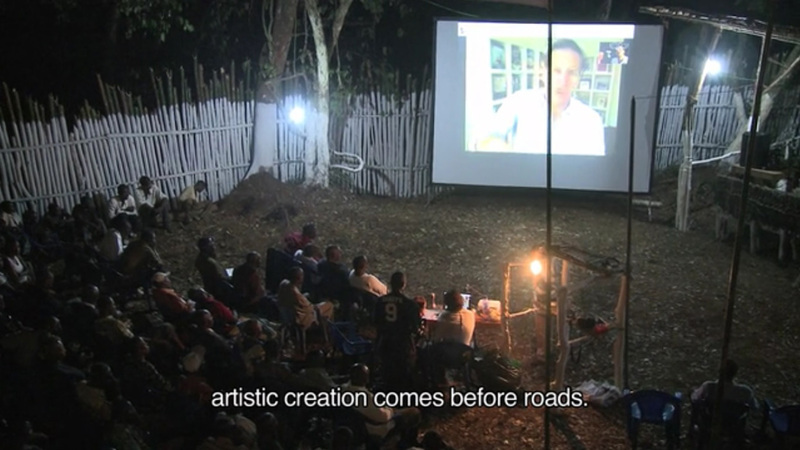 In a more or less similar vein, the Dutch-Belgian Institute for Human Activities (IHA) describes the purpose of the Gentrification Program it has established in the Democratic Republic of Congo as ‘first, to make critical artistic reflection profitable for one of the world’s poorest populations and, second, to recalibrate art’s critical mandate by fully acknowledging its position in the global economy.’25 The order is of particular importance here: according to the organization itself, the primary aim of the Gentrification Program is to ‘gentrify’ in the non-pejorative sense of the term, to intervene materially in an attempt to improve people’s conditions of living. It does so by organizing workshops, but also by selling artworks and exploiting partnerships, sponsorships and subsidies. Most notably, the IHA sells 3D-printed chocolate multiples, reproductions of sculptures created by participants in the Gentrification Program. The IHA calls this form of artistic practice ‘value shifting,’ as it intends to bring prosperity to people in the so-called global South, rather than to already overdeveloped parts of the world where art and the 'creative class' have long proven their effectiveness as instruments for gentrification. One enormous difference between the IHA and the Robin Hood Coop is that the former very clearly emerges from the institutionalized art world, and could only function there – and more specifically, within the framework of the oeuvre of its artistic director, Renzo Martens. Indeed, the stated purpose of this institution is to intervene materially and bring about actual economic improvements around its settlement in Congo, but since the founding of the institute in 2010, it has remained entirely obscure as to what extent it is in fact managing to do so or not. Sven Lütticken has argued that the critical issue of the IHA is that ‘the exhibition of chocolate sculptures and the relegation of their makers to an intriguing state of semi-obscurity ultimately seems designed to boost Martens’s visibility to ever greater heights.’26 Indeed, Martens’s being so ostensibly the face and facade of a hidden abode of sculpture production is problematic. But what seems even more troubling is that the IHA has as of yet failed make a convincing argument that Martens’s authorial presence and persona are put to good work in the Gentrification Program. Rather than realizing any concrete improvements for its participants in the DRC, the IHA ultimately remains an art project that aims to be interesting first and foremost and has not managed to really intervene materially. As such, one might call it a singularized and aestheticized yet ineffective take on Tony’s Chocolonely – a Dutch company that strives to mass-market ‘slave-free chocolate.’ Ultimately, the IHA fits all too seamlessly within the overly self-reflexive yet quasi-cynical cult of complicity that some critical segments of the art world at times resemble. That both the Robin Hood Coop and the IHA’s Gentrification Program are ‘bad’ and wholly unsatisfying examples of artistic laundering is clear enough. However, this does not have to mean that better practices and models for the redistribution of wealth via art and its institutions could not be developed. Even so, some might consider these practices and models to be other instances of cultural tactics content to intervene at a micro-level while leaving structural inequalities, economic as well as symbolic, intact. The crucial question therefore remains as to whether or not any concrete changes that may be achieved within these practices are futile in the face of the destructive forces of financialization. 1. Fredric Jameson, ‘Culture and Finance Capital,’ Critical Inquiry 24, no. 1 (1997), 260. 2. Franco ‘Bifo’ Berardi, The Uprising: On Poetry and Finance (Los Angeles: semiotext(e), 2012), 134–135. 3. McKenzie Wark, A Hacker Manifesto (Cambridge, Massachusetts: Harvard University Press, 2004), thesis 169. 4. It is worth mentioning that Jeff Kinkle and Alberto Toscano are discussing Isaac Julien’s film Playtime (2014), a highly problematic work in many respects (and therefore perhaps not the best basis for generalizing statements concerning the art world). Jeff Kinkle and Alberto Toscano, Cartographies of the Absolute (Winchester: Zero Books, 2015), 181. 5. Isabelle Graw, High Price: Art Between the Market and Celebrity Culture (Berlin: Sternberg Press, 2009), 29. 6. Karl Marx, Capital, Volume I (London: Penguin & New Left Review, 1990), 197. 7. Melanie Gilligan, ‘Derivative Days: Notes on Art, Finance, and the Unproductive Forces,’ in It’s the Political Economy, Stupid: The Global Financial Crisis in Art and Theory, ed. Oliver Ressler and Gregory Sholette (London: Pluto Press, 2013), 72–83. 8. ‘Andy Warhol’s Iconic 200 One Dollar Bills Sells for $43,762,500 at Sotheby’s,’ Art Daily, 28 May 2015, artdaily.com. 9. Benjamin Buchloh, ‘Andy Warhol’s One-Dimensional Art: 1956-1966,’ in Andy Warhol, ed. Annette Michelson (Cambridge, MA: MIT Press, 2001), 10. 10. Hal Foster, ‘Death in America,’ in Andy Warhol, ed. Annette Michelson (Cambridge, Massachusetts: MIT Press, 2001), 71. 11. Julia Bryan-Wilson, Art Workers (Los Angeles: University of California Press, 2009), 26–27. 12. Igor Kopytoff, ‘The Cultural Biography of Things: Commoditization as Process,’ in The Social Life of Things: Commodities in Cultural Perspective, ed. Arjun Appadurai (Cambridge, UK: Cambridge University Press, 1986), 69. 13. Boris Groys, ‘The Weak Universalism,’ e-flux journal 15 (2010), worker01.eflux.com. 14. Jean-Joseph Goux, ‘Numismatics: An Essay in Theoretical Numismatics,’ in Symbolic Economies After Marx and Freud, trans. Jennifer Curtiss Gage (Ithaca: Cornell University Press, 1990), 31. 15. Ibid., 49. This is the orthodox Marxist position; Goux’s text is essentially an elaboration of Marx’s own writings on the subject in the first volume of Capital, plus added Freudian wizardry. For a very different account of the history of money, see David Graeber, Debt: The First 5,000 Years (Brooklyn: Melville House, 2011). 16. The Bretton Woods system was an international monetary management system, established in 1944. It was ended when the US (under Richard Nixon) unilaterally ended the convertibility of the US dollar, thus rendering it a fiat currency. 17. Richard Duncan, ‘Interview: A New Global Depression?,’ New Left Review 77 (2012), 23. 19. A similar question has been raised by Alex Williams. Like Pasquinelli, Williams arrives there by way of Alfred Sohn-Rethel, though he seems to couple the question with a somewhat naive belief in the promethean powers of abstraction to overcome any potential obstacle whatsoever; see Alex Williams, ‘The Politics of Abstraction,’ in Speculative Aesthetics, ed. Robin Mackay, Luke Pendrell and James Trafford (Falmouth: Urbanomic, 2014). 20. Bernard Stiegler, ‘The Age of De-proletarianisation: Art and teaching art in post-consumerist culture,’ in Art Futures. Current issues in higher arts education, ed. Kieran Corcoran, Carla Delfos and Floris Solleveld (Amsterdam: ELIA, 2010), 11, elia-artschools.org. 21. Martha Rosler, Culture Class (Berlin: Sternberg Press, 2013), 116. 22. Andrea Fraser, ‘L’1%, C’est Moi!,’ 29 May 2015 , whitney.org. 23. ‘Interview with Jan Ritsema and Akseli Virtanen,’ ‘Art House Index Issue,’ In-residence Magazine (2015), 71–72. 24. See robinhoodcoop.org. Interestingly, however, during the time of writing this section was removed from the coop’s website, which now mentions nothing about the artistic nature of the project and does not mention that it was initiated at an art academy. 25. Institute for Human Activities, ‘Value Shifting,’ in Truth is Concrete. A Handbook for Artistic Strategies in Real Politics, ed. Florian Malzacher and steirischer herbst (Berlin: Sternberg Press, 2014), 324. 26. Sven Lütticken, ‘Social Media: Practices of (In)visibility in Contemporary Art,’ Afterall, 23 September 2015, afterall.org. In this contribution to Commonist Aesthetics, Matteo Pasquinelli, referring to Alfred Sohn-Rethel and Alain Badiou, questions the master-slave relation between Captial and Number. Money can be regarded as an abstract machine like others that replaces and amplifies previous social relations. As any other machine, it can be analyzed according to its inputs and outputs, to the division of labour and social relations that it engenders. The new abstractions of science, the new technologies of computation and augmented intelligence, should be adopted within an extended definition of both money and labour, Pasquinelli asserts.